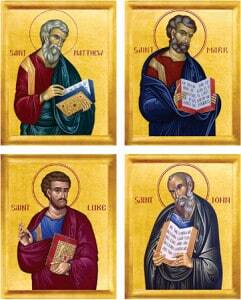 Information on the Four Gospels as they were read individually and also as harmonies and mergers over the centuries. How is The Synoptic Gospel Better than Four Separate Gospels? There are many ways that The Synoptic Gospel is better than reading the four separate Gospel accounts of the life and ministry of Jesus Christ. The biggest advantage with having a merged harmony of the four Gospels of the New Testament is that when the texts are aligned, and the words are combined and merged on a word-for-word basis, all of the repetition of the stories, and the duplication of their words is removed. Almost half (49%) of all of the 3,779 verses that make up the four Gospels are repeated or paralleled in one or more of the other Gospel accounts. By consolidating the overlapping and repeated words, a text is produced that is fully 22% shorter, and this makes it not only faster to read, but the story is now much easier to understand. FIVE COLUMN – The Synoptic Gospel is a valuable tool for every Pastor to use when composing a Sermon or lesson from the Gospels! Now it is easy to see which Gospel verses are part of a parallel set – meaning that the same saying or story is told in two or more of the four Gospel accounts. While it does not always make a difference as to which version of a story is used from which Gospel, sometimes the differences between the accounts can be very important, and in these cases, it is useful to see what the different versions of the saying or event from each of the Gospels are.